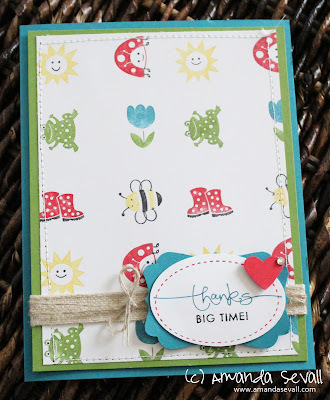 Amanda Sevall Designs: Card: Spring Sampler Thanks Big Time! Card: Spring Sampler Thanks Big Time! I love the sets of image only stamps.... so easy to mix and match with sentiment stamp sets. This was a simple, yet labor intensive card since I colored all the stamps with my markers! I lined up six of the images on one clear block and used it to make my own patterned paper. 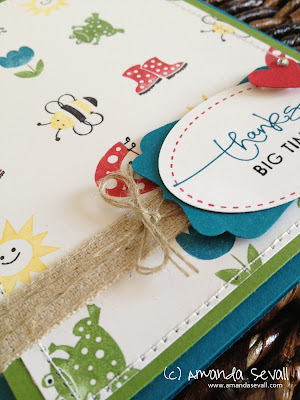 Have you tried making your own patterned paper with your stamps? Link up if you have... I'd love to see! Such a cute card and so clever. I will have to try this.